Sneezeguard Solutions ® Storecart Caster Kits are designed to be inserted into the bottom of the Storecart framework for easy installation. 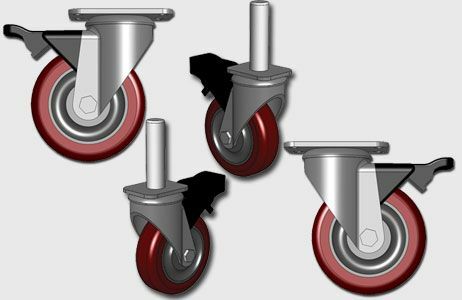 The Caster Kits consist of 4 casters, 2 casters have directional locks and the remaining 2 have locks to stop the casters from rolling. The casters are made from Performa© thermoplastic in order to be non-marking on your facility floors and long-lasting. The Storecart Caster Kit is used to fit Sneezeguard Solutions® Storecarts.